Naturalised trees are thinly scattered throughout the country. and is widely planted in gardens and parks. hedges and scrub-land, and beside roads and paths. Naturalised trees have been known since the 1920s. 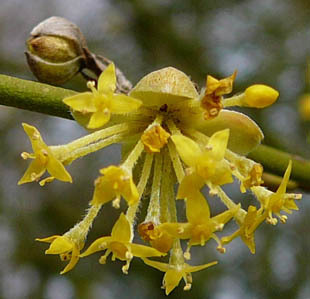 Cornelian-cherry is a small tree, which flowers early in the year. 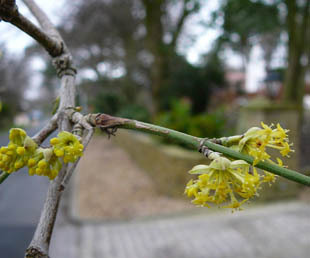 Flowers are in clusters with 4 bright, yellow-green bracts. 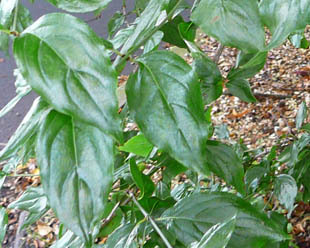 Leaves are dark green, oval and pointed. It has red and orange berries, but rarely in England.